2.3. RGD Density Measurement The RGD density in GelMA macromers was quantified by reacting arginine groups with 9,10-phenanthrenequinone (Wako) to produce a fluorescence compound. Briefly, 1 mg/mL gelation or GelMA was mixed with 300 µL of an ethanol solution of 9,10-phenanthrenequinone (150 µM) and 50 µL of NaOH aqueous solution (2 N). The mixture was incubated at 60 ˝ C under dark for 3 h. Then 200 µL of each sample was mixed with 200 µL of HCl (1.2 N) and the mixture was allowed to stand at room temperature under dark for 1 h. The emission of the mixture was measured at an excitation wavelength of 312 nm by an FP-6500 spectrofluorometer (JASCO, Tokyo, Japan) [37,38]. 2.4. Preparation of GelMA Hydrogels GelMA macromers (10 wt %) and photo-initiator, 2-hydroxy-1-(4-(hydroxyethoxy) phenyl)-2methyl-1-propanone (Irgacure 2959, Sigma-Aldrich, St. Louis, MO, USA) (0.5 wt %), were dissolved in PBS at 50 ˝ C. The solution was added into the space between two quartz glass coverslips separated by a 1 mm-thick spacer made from silicone gel sheet (KOKEN, Tokyo, Japan). The construct was exposed to 365 nm UV light (CL-1000, Funakoshi, Tokyo, Japan) at a distance of 20 cm for 2 min. 2.5. Mechanical Testing Atomic force microscopy (AFM, MFP-3D-Bio; Asylum Research, Santa Barbara, CA, USA) was applied to determine the stiffness of GelMA hydrogels. The hydrogel samples were incubated in PBS at 37 ˝ C for 24 h and then their stiffness was measured at room temperature. An optical microscope was used to control the position of the AFM tip. Silicon nitride cantilevers (Bruker, Camarillo, CA, USA) with a 600 nm diameter glass ball were used as the probe. The exact spring constant was measured before each experiment using a thermal tuning method. The force curves were collected and fitted to Hertz’s contact model to calculate the Young’s modulus . Nine samples of each group were measured for calculation of means and standard deviations. 2.6. Swelling Ratio Measurement To determine the mass swelling ratio, hydrogels were punched into disks with a 6 mm biopsy punch. The hydrogel disks were soaked in PBS at 37 ˝ C for 24 h. The samples were blotted with a KimWipe paper to remove the residual liquid and weighed to obtain the equilibrium wet weight. The dry weight was the sample weight after freeze-drying. The mass swelling ratio was calculated by dividing the equilibrium wet weight by the dry weight of the hydrogel disks . 2.7. Measurement of Enzymatic Degradation of Hydrogels GelMA hydrogels with different stiffness were prepared and punched into disk with an 8 mm diameter biopsy punch following by swollen in PBS for 24 h to reach swelling equilibrium. The swollen hydrogel disks were immersed in 2 mL of PBS containing 10 units¨ mL´1 of collagenase (Worthington Biochemical Corp., Lakewood, NJ, USA) and incubated at 37 ˝ C in an orbital shaker at a shaking speed of 60 rpm. At the time points of 1, 2, 4, 9, and 20 h, the hydrogel samples were taken out and weighed after being blotted. The degradation degree of the hydrogels was determined by normalizing the residual hydrogel wet weight to the initial wet weight. Three samples were used at every time point for the measurement to calculate means and standard deviations. 2.8. Culture of Chondrocytes in Hydrogels Chondrocytes were isolated from articular cartilage from the knees of a nine week old calf according to previously reported protocol [39,40]. The isolated primary chondrocytes were cultured in 75 cm2 tissue culture flasks in Dulbecco’s Modified Eagle Medium (DMEM) supplemented with 10% fetal bovine serum, 4500 mg¨ L´1 glucose, 4 mM glutamine, 100 U¨ mL´1 penicillin, 100 µg¨ mL´1 streptomycin, 0.1 mM nonessential amino acids, 0.4 mM proline, 1 mM sodium pyruvate, and 50 µg¨ mL´1 ascorbic acid at 37 ˝ C and 5% CO2 . The cells were subcultured after confluence and the cell culture medium was refreshed every three days. The chondrocytes at passage two were used in the following experiments. The cells were detached with a trypsin/EDTA solution, collected by centrifugation, counted with a hemocytometer and re-suspended in the PBS solutions containing GelMA macromers (10 wt %) and photo-initiator Irgacure 2959 (0.5 wt %) to obtain cell suspension at a density of 2 ˆ 107 cell/mL. The suspension solution was used to prepare cell-laden hydrogels in the same manner as above described. The quartz glass coverslips were sterilized before usage and all of the experimental procedures were conducted sterilely in a clean bench. The cell-laden hydrogels were then punched into disks (6 mm diameter ˆ 1 mm thickness) with a sterile 6 mm biopsy punch. The cells in the hydrogel disks were cultured in DMEM medium at 37 ˝ C and 5% CO2 under shaking for 14 days and the medium was changed every two days. 2.9. Cell Viability Assay Live/dead staining was performed to evaluate cell viability of chondrocytes in the hydrogels by using Cellstain Double Staining Kit (Dojindo Laboratories, Tokyo, Japan). After one and seven days of culture, the cell-laden hydrogel disks were washed with PBS and incubated with serum-free medium containing calcein-AM (2 µM) and propidium iodide (4 µM) for 15 min. After that, the live cells and dead cells in the interior areas of hydrogels were observed under a fluorescence microscope (U-RFL-T; Olympus, Tokyo, Japan). 2.10. Cytoskeleton Actin Filament Staining The cytoskeleton of chondrocytes in the hydrogels after seven and 14 days of culture was observed by actin filament (F-actin) staining. The cell-laden hydrogel disks were washed with PBS three times, fixed with 4% paraformaldehyde at 4 ˝ C for 24 h, and further washed two times with PBS. And then the cell-laden hydrogel disks were immersed in 5 mL of 0.2% Triton X-100 for 50 min to permeabilize the cells. After being washed with PBS three times and blocked with 1% bovine serum albumin (BSA) solution at room temperature for 30 min, the samples were immersed in 1 mL PBS containing 40-fold diluted Alexa FluorVR 488 phalloidin (Invitrogen, Carlsbad, CA, USA) for 60 min to stain actin filaments. Cell nuclei were stained with 1000-fold diluted 41 ,6-diamidino-2-phenylindole dihydrochloride (DAPI, Dojindo Laboratories, Kumamoto, Japan) solution in PBS at room temperature for 10 min. After staining, cell-laden hydrogel disks were rinsed with PBS again and their fluorescence images were captured using a confocal microscope (LSM 510 Meta; Zeiss, Oberkochen, Germany). Figure H NMR spectra of unmodified gelatin (Gel), GelMA macromers with different DoF Figure 1. 1H1.NMR spectra of unmodified gelatin (Gel), GelMA macromers with different DoF (Low (Low GelMA, Medium GelMA, and High GelMA). GelMA, Medium GelMA, and High GelMA). Table 1. The DoF of Low GelMA, Medium GelMA, and High GelMA. The arginine residues in gelatin also have amino groups that may react with MA. Therefore, the the content of arginine residues in the GelMA macromers was measured to confirm if the RGD content of arginine residues in the GelMA macromers was measured to confirm if the RGD density density was changed after the modification. The amino groups in arginine residues can react was changed after the modification. The amino groups in arginine residues can react with 9, 10with 9,10-phenanthrenequinone to produce a fluorescence compound. Unmodified gelatin and the phenanthrenequinone to produce a fluorescence compound. Unmodified gelatinthe andsame the three types three types of GelMA macromaers with low, medium, and high DoF had almost level of of GelMA macromaers with low, medium, and high DoF had almost the same level of fluorescence fluorescence absorbance (Figure 2). Blank control without RGD prepared by deionized water did not absorbance (Figure 2). Blankabsorbance control without RGD prepared byresults deionized water didarginine not show show obvious fluorescence at the wavelength range. The indicated that the content in Gel and GelMA macromers almost the same, which the arginine be obvious fluorescence absorbance at thewas wavelength range. Thesuggests results that indicated that should the arginine not in involved in GelMA the reaction even at a high Therefore, the RGD density in allthat the GelMA hydrogels content Gel and macromers was DoF. almost the same, which suggests the arginine should prepared from typeseven of GelMA macromers should be kept the same levels, which be not involved inthe thethree reaction at a high DoF. Therefore, the at RGD density in all the was GelMA important to exclude the influence of different density of active RGD motifs. hydrogels prepared from the three types of GelMA macromers should be kept at the same levels, which was important to exclude the influence of different density of active RGD motifs. absorbance (Figure 2). Blank control without RGD prepared by deionized water did not show obvious fluorescence absorbance at the wavelength range. The results indicated that the arginine content in Gel and GelMA macromers was almost the same, which suggests that the arginine should be not involved in the reaction even at a high DoF. Therefore, the RGD density in all the GelMA hydrogels prepared from the three types of GelMA macromers should be kept at the same levels, Polymers 2016, 8, 269 7 of 15 which was important to exclude the influence of different density of active RGD motifs. 3.3. Ratio of of GelMA GelMA Hydrogels Hydrogels 3.3. Young’s Young’sModulus Modulus and and Swelling Swelling Ratio Three were prepared preparedfrom fromGelMA GelMAmacromers macromerswith withthe thesame same concentration Three types types of hydrogels hydrogels were concentration of (10 wt wt%) %)but butdifferent different DoF. stiffness of GelMA hydrogels was measured by The AFM. of gelatin gelatin (10 DoF. TheThe stiffness of GelMA hydrogels was measured by AFM. The GelMA hydrogels prepared GelMA medium, and high had Young’s modulus GelMA hydrogels prepared fromfrom GelMA withwith low,low, medium, and high DoF DoF had Young’s modulus of of 17.1 ˘ 2.4, and 29.9 ˘ 3.4 kPa, respectively (Figure expected, high DoF resulted 3.83.8 ±˘ 0.3,0.3, 17.1 ± 2.4, and 29.9 ± 3.4 kPa, respectively (Figure 3a).3a). AsAs expected, high DoF resulted in in GelMA hydrogels hydrogels with significantly that thethe GelMA GelMA significantly increased increasedYoung’s Young’smodulus. modulus.The Theresults resultsshowed showed that GelMA hydrogels with with aa broad range of stiffness hydrogels stiffness could could be begenerated generatedby byadjusting adjustingthe theDoF DoFofofmacromers. macromers. Figure 3. 3. Young’s hydrogels with high, Figure Young’s modulus modulus (a) (a) and and equilibrium equilibriumswelling swellingratio ratio(b) (b)ofofGelMA GelMA hydrogels with high, medium, and low stiffness. Means ± SD, n = 3. *** p < 0.001; ** p < 0.01. medium, and low stiffness. Means ˘ SD, n = 3. *** p < 0.001; ** p < 0.01. Figure 4. Enzymatic degradation of GelMA hydrogels in the presence of 10 unit·mL−1 of collagenase Figure 4.Means Enzymatic degradation of GelMA hydrogels in the presence of 10 unit·mL−1 of collagenase at 37 °C.4. ± SD,degradation n = 3. Figure Enzymatic of GelMA hydrogels in the presence of 10 unit¨ mL´1 of collagenase at 37 °C. Means ± SD, n = 3. at 37 ˝ C. Means ˘ SD, n = 3. 3.5. Cell Viability in GelMA Hydrogels 3.5. 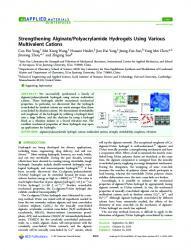 Cell Viability in GelMA Hydrogels 3.5. Cell GelMA Hydrogels by live/dead staining after chondrocytes were encapsulated in CellViability viabilityinwas investigated Cell viability was investigated byfor live/dead staining after chondrocytes were encapsulated in the GelMA hydrogels and cultured one and seven In all the groups, most ofin the Cell viability was investigated by live/dead staining afterdays. chondrocytes were encapsulated the the GelMA hydrogels and cultured for one and seven days. In all the groups, most of the chondrocytes wereand alive (green for color) few dead were observed color) after one GelMA hydrogels cultured oneand andonly seven days. Incells all the groups, most(red of the chondrocytes chondrocytes were alive (green color) and only few dead cells were observed (red color) afterhigh one and days ofcolor) culture 5).dead The results indicated that thecolor) cells after in theone hydrogels had wereseven alive (green and(Figure only few cells were observed (red and seven days of and seven days of culture (Figure 5). The results indicated that the cells in the hydrogels had high cell viability even afterresults the photo-crosslinking suggesting maycell be aviability good strategy to culture (Figure 5). The indicated that the process, cells in the hydrogelsthat hadithigh even after cell viability even after the photo-crosslinking process, suggesting that it may be a good strategy to use the GelMA hydrogels for cell encapsulation. Furthermore, live cell density seemedhydrogels to be the the photo-crosslinking process, suggesting that it may be a goodthe strategy to use the GelMA use the GelMA for cell encapsulation. Furthermore, the live cell density seemed to be the same all thehydrogels GelMAFurthermore, hydrogels, suggesting the stiffness GelMA did not have for cellforencapsulation. the live cellthat density seemed of to be the same for all theobvious GelMA same for all the GelMA hydrogels, suggesting that the stiffness of GelMA did not have obvious influence on cell viability. hydrogels, suggesting that the stiffness of GelMA did not have obvious influence on cell viability. influence on cell viability. Cytoskeletal configuration and regulation have been reported to play an important role in the process of chondrogenesis . It was recognized that round cell morphology and decreased actin cytoskeletal organization are beneficial for the chondrogenesis of mesenchymal stem cells (MSCs) [43,44]. Spherical aggregation was also beneficial for chondrogenesis due to the increased intercellular contacts [45,46]. The high stiffness GelMA hydrogels had a high Young’s modulus and a high degree of cross-linking, which inhibited cell spreading and resulted in weak F-actin filament network formation. The microenvironment of high stiffness hydrogels also promoted spherical Polymers 2016, 8, Similar 269 of 15 aggregation. cell morphology was observed in medium stiffness GelMA hydrogels after10seven days of culture. However, most cells in the medium stiffness GelMA hydrogels spread after 14 days of which due be todue thetocontinuous proteolytic degradation of of hydrogels. This culture,might whichbe might the continuous proteolytic degradation hydrogels. Thissuggested suggestedthe the hydrogels with high stiffness could support the maintenance of the round morphology of hydrogels with high stiffness could support the maintenance of the round morphology of chondrocytes, chondrocytes, in agreement with the previous study . in agreement with the previous study . 3.7. 3.7.Histological HistologicalStainings Stainings Cell production of of thethe chondrocytes after 14 days of Cell morphology morphologyand andcartilaginous cartilaginousmatrices matrices production chondrocytes after 14 days culture in the GelMA hydrogels werewere further investigated by histological staining (Figure 7). HE of culture in the GelMA hydrogels further investigated by histological staining (Figure 7). staining indicated a homogeneous cell distribution for all the GelMA hydrogels. The chondrocytes HE staining indicated a homogeneous cell distribution for all the GelMA hydrogels. The chondrocytes showed showedround roundmorphology morphologyin inthe thehigh highstiffness stiffnessGelMA GelMAhydrogels, hydrogels,while whileshowing showingaapartially partiallyspreading spreading morphology morphologyin in medium medium stiffness stiffness GelMA GelMA hydrogels. hydrogels. InIncontrast, contrast,cells cellsininthe the low low stiffness stiffness GelMA GelMA hydrogels showed an elongated morphology. The elongation of cells in low stiffness hydrogels hydrogels showed an elongated morphology. The elongation of cells in low stiffness hydrogelsmight might be the chondrogenic chondrogenic phenotype phenotype [43,44]. be aa signal signal of of losing losing the [43,44]. Safranin-O Safranin-O staining staining indicated indicatedthat that more more proteoglycans proteoglycanswere weredetected detectedin inthe thehigh highstiffness stiffnessGelMA GelMAhydrogels hydrogelsthan thanthe theother othertwo twogroups. groups.The Thecells cells cultured in medium stiffness GelMA hydrogels showed partially positive staining of proteoglycans, cultured in medium stiffness GelMA hydrogels showed partially positive staining of proteoglycans, while the chondrocytes chondrocytescultured cultured in the stiffness GelMA hydrogels lost their proteoglycans while the in the low low stiffness GelMA hydrogels lost their proteoglycans secretion secretion capacity obviously. capacity obviously. Figure Figure7.7.HE HEand andsafranin-O safranin-Ostainings stainingsof ofchondrocytes chondrocytescultured culturedin inthe theGelMA GelMAhydrogels hydrogelsfor for14 14days. days. Figure 8. 8. DNA DNA amount amount(a); (a);sGAG/DNA sGAG/DNA ratio ratio(b); (b);and andexpression expressionofofgenes genes encoding collagen type II Figure encoding collagen type II (c) (c) and aggrecan (d) of chondrocytes cultured in the GelMA hydrogels for 14 days. Means ± SD, n = and aggrecan (d) of chondrocytes cultured in the GelMA hydrogels for 14 days. Means ˘ SD, n = 3. 3. ** p < 0.01; * p < 0.05. ** p < 0.01; * p < 0.05.
type II and aggrecan. It has been reported that high spreading can be observed in physiological extracellular matrices with high degradation rate and quick stress relaxation [55,56]. All of our results suggested the GelMA hydrogels with high stiffness had the best function for the maintenance of chondrocyte phenotype. The results of this study are different from some previous studies [19,20,22]. Some previous studies have reported that lower stiffness hydrogels had a better maintenance function of chondrogenic phenotype. The difference of stiffness range and material properties between this study and the previous studies might be the reasons for the different results. The high stiffness in this study was at the same range as the low stiffness of the previous studies. The Young’s modulus of hydrogels in this study was controlled to mimic the mechanical property of cartilage ECM [57–59]. However, the stiffness range was far from the rigidity of native cartilage (400–800 kPa) [59,60]. This might be one reason. The materials property including adhesion sites and degradable sites might be another reason. In PEG, agarose and HA hydrogels, cells keep round shape in lower stiffness hydrogels until sufficient extracellular matrices are produced [61,62]. But in gelatin based hydrogels, cells can easily spread . Presence of RGD in the hydrogels can promote cell spreading. It is important to investigate the influence of matrix stiffness on chondrogenic phenotype by using natural ECM protein materials (collagen and gelatin, etc.) because they have RGD and MMP degradable sequences to better mimic the microenvironment as compared with other natural polymer or synthetic materials, such as HA and PEG. 4. Conclusions GelMA hydrogels with different stiffness and the same RGD density were fabricated by adjusting the degree of methacryloyl substitution of same concentration of gelatin. The Young’s modulus increased with the degree of functionalization. Cell cultured in the hydrogels showed high viability. Bovine chondrocytes cultured in the high stiffness GelMA hydrogels showed rounder morphology, secreted more cartilaginous matrices, and exhibited higher expression of collagen II and aggrecan genes compared to the cells cultured in medium and low stiffness GelMA hydrogels. The high-stiffness GelMA hydrogels had the highest capacity of maintaining the phenotype of chondrocytes. Acknowledgments: This work was supported by the World Premier International Research Center Initiative (WPI) on Materials Nanoarchitectonics and JSPS KAKENHI Grant Number 15K12548 from the Ministry of Education, Culture, Sports, Science and Technology, Japan. Author Contributions: Guoping Chen, Naoki Kawazoe and Xiaomeng Li designed of the whole study; Xiaomeng Li, Shangwu Chen, Jingchao Li, Xinlong Wang and Jing Zhang performed the experiments and analyzed the data; Guoping Chen and Naoki Kawazoe provided all the reagents and instruments; Xiaomeng Li, Guoping Chen and Jingchao Li wrote and revised the manuscript finally. All authors read and approved the final manuscript. Conflicts of Interest: The authors declare no conflict of interest. 58. 59. 60. 61. 62. Liu, Y.; Chan-Park, M.B. A biomimetic hydrogel based on methacrylated dextran-graft-lysine and gelatin for 3D smooth muscle cell culture. Biomaterials 2010, 31, 1158–1170. [CrossRef] [PubMed] Lv, H.; Li, L.; Sun, M.; Zhang, Y.; Chen, L.; Rong, Y.; Li, Y. Mechanism of regulation of stem cell differentiation by matrix stiffness. Stem Cell Res. Ther. 2015, 6, 103. [CrossRef] [PubMed] Allen, J.L. ; Cooke, M.E. ; Alliston, T. ECM stiffness primes the TGFβ pathway to promote chondrocyte differentiation. Mol. Biol. Cell 2012, 23, 3731–3742. [CrossRef] [PubMed] Chung, C.; Burdick, J.A. Influence of three-dimensional hyaluronic acid microenvironments on mesenchymal stem cell chondrogenesis. Tissue Eng. Part A 2008, 15, 243–254. [CrossRef] [PubMed] Acharya, C.; Adesida, A.; Zajac, P.; Mumme, M.; Riesle, J.; Martin, I.; Barbero, A. Enhanced chondrocyte proliferation and mesenchymal stromal cells chondrogenesis in coculture pellets mediate improved cartilage formation. J. Cell. Physiol. 2012, 227, 88–97. [CrossRef] [PubMed] Marklein, R.A.; Burdick, J.A. Controlling stem cell fate with material design. Adv. Mater. 2010, 22, 175–189. [CrossRef] [PubMed] Chen, S.; Zhang, Q.; Nakamoto, T.; Kawazoe, N.; Chen, G. Gelatin scaffolds with controlled pore structure and mechanical property for cartilage tissue engineering. Tissue Eng. Part C Methods 2016, 22, 189–198. [CrossRef] [PubMed] Zhang, K.; Wang, L.; Han, Q.; Heng, B.C. ; Yang, Z.; Ge, Z. Relationship between cell function and initial cell seeding density of primary porcine chondrocytes in vitro. Biomed. Eng. Appl. Basis Commun. 2013, 25, 1340001. [CrossRef] Khetan, S.; Guvendiren, M.; Legant, W.R.; Cohen, D.M. ; Chen, C.S. ; Burdick, J.A. Degradation-mediated cellular traction directs stem cell fate in covalently crosslinked three-dimensional hydrogels. Nat. Mater. 2013, 12, 458–465. [CrossRef] [PubMed] Chaudhuri, O.; Gu, L.; Klumpers, D.; Darnell, M.; Bencherif, S.A.; Weaver, J.C.; Huebsch, N.; Lee, H.-P.; Lippens, E.; Duda, G.N. ; et al. Hydrogels with tunable stress relaxation regulate stem cell fate and activity. Nat. Mater. 2016, 15, 326–334. [CrossRef] [PubMed] Gao, Y.; Liu, S.; Huang, J.; Guo, W.; Chen, J.; Zhang, L.; Zhao, B.; Peng, J.; Wang, A.; Wang, Y. The ECM-cell interaction of cartilage extracellular matrix on chondrocytes. Biomed. Res. Int. 2014, 2014, 1–8. 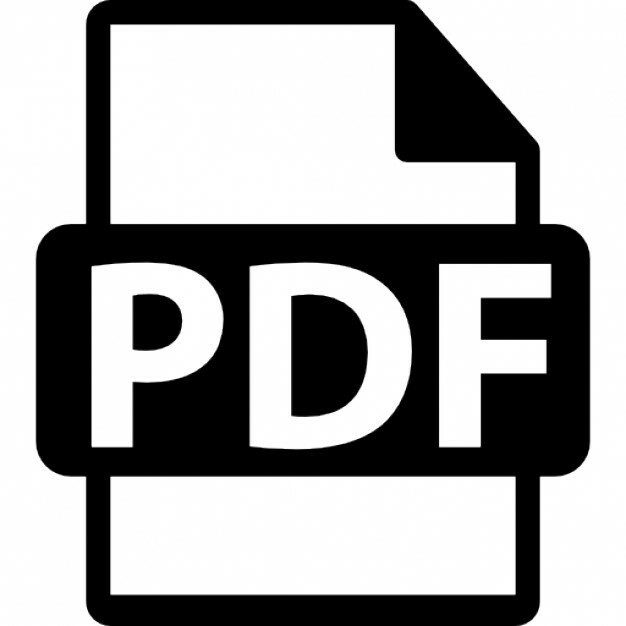 [CrossRef] [PubMed] Zhang, Z. Chondrons and the pericellular matrix of chondrocytes. Tissue Eng. Part B Rev. 2014, 21, 267–277. 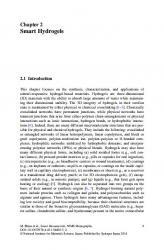 [CrossRef] [PubMed] Alexopoulos, L.G. ; Setton, L.A.; Guilak, F. The biomechanical role of the chondrocyte pericellular matrix in articular cartilage. Acta Biomater. 2005, 1, 317–325. [CrossRef] [PubMed] Buxboim, A.; Ivanovska, I.L. ; Discher, D.E. Matrix elasticity, cytoskeletal forces and physics of the nucleus: How deeply do cells ‘feel’outside and in? J. Cell Sci. 2010, 123, 297–308. [CrossRef] [PubMed] Koh, W.-G.; Revzin, A.; Pishko, M.V. Poly(ethylene glycol) hydrogel microstructures encapsulating living cells. Langmuir 2002, 18, 2459–2462. [CrossRef] [PubMed] Anderson, S.B. ; Lin, C.-C.; Kuntzler, D.V. ; Anseth, K.S. The performance of human mesenchymal stem cells encapsulated in cell-degradable polymer-peptide hydrogels. Biomaterials 2011, 32, 3564–3574. [CrossRef] [PubMed] © 2016 by the authors; licensee MDPI, Basel, Switzerland. This article is an open access article distributed under the terms and conditions of the Creative Commons Attribution (CC-BY) license (http://creativecommons.org/licenses/by/4.0/). continuously measured the oxygen concentrations in the center of cell-seeded scaffolds and in the sur- rounding medium.